Materials science is on the move at many universities and colleges across the nation. 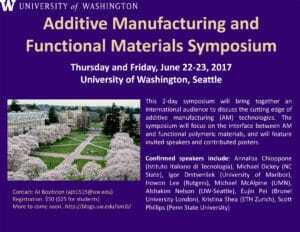 The University of Washington created the Advanced Materials & Additive Manufacturing (AM) Initiative and held their inaugural 3D Printing Symposium last March (2016) as a one day event. Last year’s event had over 100 attendees with 28 percent industry and 72 percent UW students, faculty or alumni. They plan to continue the event this year, but expand it to a 2-day event this June 22 – 23, 2017. The Additive Manufacturing and Functional Materials Symposium will bring together an international audience to discuss the cutting edge of additive manufacturing (AM) technologies. It will focus on the interface between AM and functional polymeric materials. Registration is $50 for regular admission; $25 for students. More details will be posted here. In addition to the materials-focused event, under the same Advanced Materials & Additive Manufacturing Initiative, the University also held a Printed Electronics Summit earlier this month. You can read about it here. As industrial additive manufacturing continues to grow, it is more and more difficult to keep up with the materials and machines. Enter the Senvol Database. Users can search this publicly available and free online database with over 30 fields, such as machine build size, material type, and material tensile strength. The sheer quantity and dynamic nature of the search fields enable users to search in powerful ways and to quickly get the information that they need. The database is in use by Fortune 500 companies and government agencies in Industries such as Aerospace, Oil and Gas, Consumer Products, and Automotive. 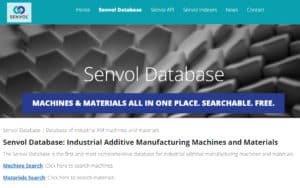 According to the website, Senvol developed the database as an internal tool initially: “For client projects, we frequently found ourselves asking questions such as ‘Which machines take titanium?’ or ‘Which polymers have a tensile strength of at least 50 MPa?’ There was no easy way to find answers to these questions, however, and we were tired of sifting through hundreds of pages of spec sheets! As a result, we created the Senvol Database to solve this problem. The database includes all industrial (that is, professional-grade) manufacturing machines and materials. The database does not include desktop machines or materials. Senvol recently created hypothetical scenarios that allow a user to learn about AM machines and material selection. The learning tool exercises help AM users get the most out of the powerful search features of the Senvol Database by introducing various ways to narrow down the options, such as by analyzing machine and material compatibility, build envelope size, total cost of ownership, and mechanical properties. The learning tool exercises, like the Senvol Database, are online and free to use. You can also download the Additive Manufacturing and Materials Learning Tool Exercises as a PDF. TEAMM Network Members will be excited to hear that the University of Washington Woof3D club has presented a series of workshops on 3D printing that can help educators at all levels interested in the topic. 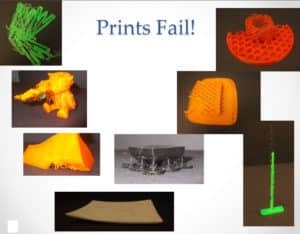 Jumping right into the challenges that most people will face when 3D printing, how prints fail, the image above gives you an idea of how workshop presenter Ben Weiss is going to lead you to successful 3D printing for you or your students. The reality is that 3D printing is amazing, but it is not, nor has never been, as simple as “pressing the print button” on an inkjet printer. Weiss addresses those common challenges and offers solutions throughout the workshop documents. You can find the 3D Printing Curriculum and Workshop documents on the TEAMM Resource page under Education. WOOF, by the way, stands for Washington Open Object Fabricators and their mission: To build awareness of and to continue the advancement of 3D Printing technology for the creative, economic, and social benefit of all. They are certainly living up to that mission by sharing this extensive and useful curriculum. If you are looking for a way to incorporate 3D printing into your school classroom, take a look at this brief, but comprehensive workshop. It also covers popular tools and how to use them. 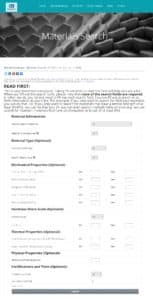 Here are the 15 documents you will find in the Zip file when you download from the TEAMM resource page. University of Washington Woof3D club developed “how-to” handouts now available for public use. This workshop material is based upon work supported by the National Science Foundation Graduate Research Fellowship Program under Grant No. DGE-1256082. Attribution for post image belongs to Ben Weiss under a Creative Commons Attribution Share Alike 2.0 license. Ben Weiss 2015. All the pictures are Ben Weiss’. -The orange house is Prof. Ganter’s model. -W clip is “Clip Peg – General purpose” by thomasforsyth http://www.thingiverse.com/thing:298955 CC-A-NC. We are excited to launch the new TEAMM “AM News” page. This new Additive Manufacturing (AM) section provides the opportunity to share news, updates, case studies, success stories and more about what our industry and the TEAMM Network is doing around the country and around the world. While much attention has been paid to the speed of AM technologies and the manufacturing process, the importance of materials in advancing Additive Manufacturing capabilities has been underserved. As new materials are developed and 3D printers are increasingly capable of utilizing multiple materials, it is imperative the technicians understand these material’s properties both individually and as they are combined during the AM process. To address this gap in the convergence of additive manufacturing and materials, the Technician Education in Additive Manufacturing & Materials (TEAMM) project is forging a new collaborative network of public and private sector stakeholders. This network will address a critical gap in supporting a new direction of technician education, including the identification and adaption of skills standards that keeps pace with advances in research and development. TEAMM will be supported through the utilization of social networking technologies, proactive identification and expansion of key stakeholders, and improved access to professional development. 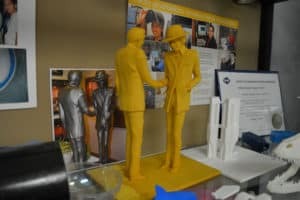 This news page will include news about Additive Manufacturing, materials, and the very important topic of how technician education intersects in these two areas. We invite you to share your news and look forward to receiving your submissions. Possible topics on materials and materials science are welcome. As we launch into 2017, a look back at some of the additive manufacturing highlights in 2016 were summarized well on the Diamandis tech blog written by X Prize Foundation founder, Peter Diamandis, who frequently talks about materials science and AM. The post (and video embedded below) is from a talk by Jeff Carbeck who presented at the Abundance annual event (also run by Diamandis) and he shared some materials science predictions for 2016 through 2018. Like many of us in the TEAMM Network, Diamandis and Carbeck see the huge potential materials science presents for Additive Manufacturing. The opportunity for manufacturing professionals and students is to track the way that technology leaders, like Diamandis, and others in Silicon Valley (and tech centers around the world) are studying it. The fusion of technology and materials is daily increasing leaving us with new ways to manufacture everything from autos to airplanes. Last, Diamandis maintains a Facebook page that is mostly dedicated to how materials science and manufacturing technology connect (some of it may be more mat sci specific, but often it has to do with making things, manufacturing).